We help companies perform strategic assessments of software systems from their portfolios. The results can be compiled as a report and/or as a presentation. These projects are best carried out together with the technical staff of the client. A typical scenario is provided by the analysis of a legacy in-house or outsourced project with the goal of checking its conformance to wanted standards and designs. Another typical problem is to support the estimation of a strategic decision to rewrite or reengineer a system. The client team provides the the source and available documents, and we spend a short period of time to understand the context. We organize one or two focused workshops together with the team in which we detail the assessment goals. We work by ourselves to identify and check the issues. 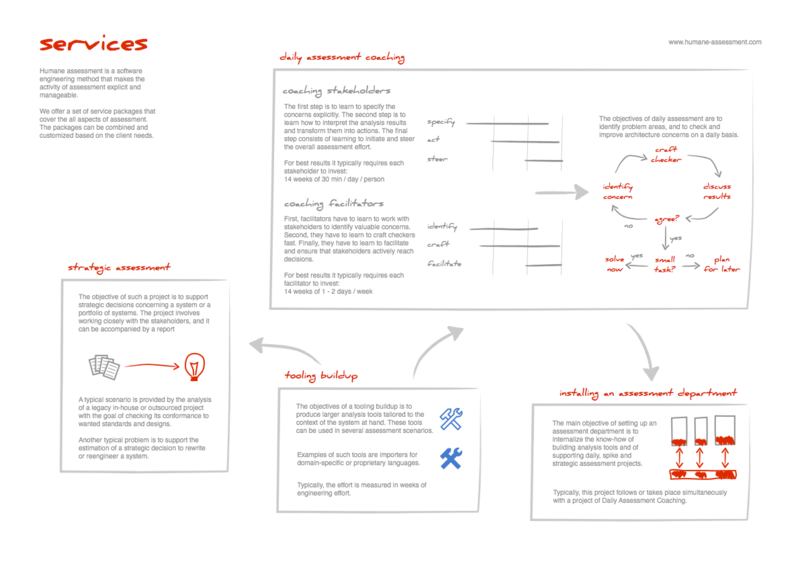 We hold a workshop with the team to distill the results, and if needed we iterate (go to 2).